I don’t know Rose but I do know her partner Oli. I’ve known Oli forever. His forever, not mine. In fact he once witnessed me fall from a horse and break my arm when he was about two and a half. But I digress. 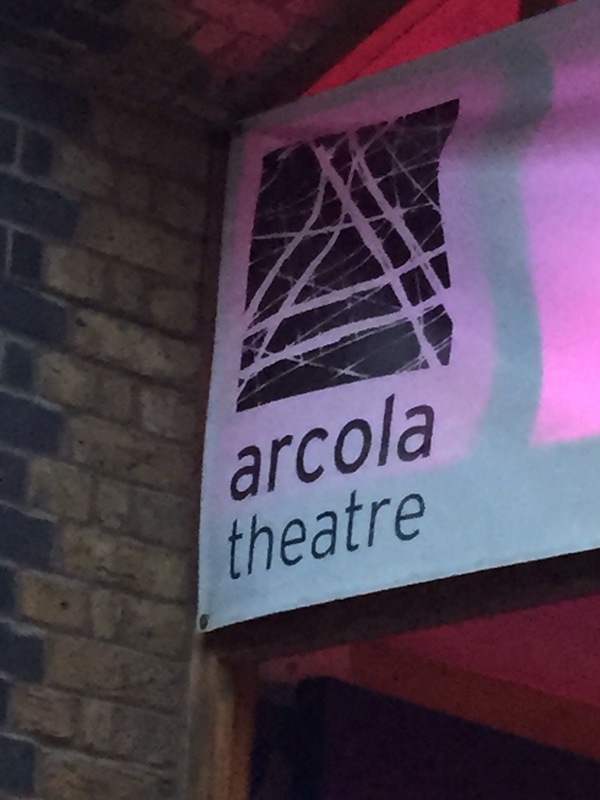 I’ve never been to the Arcola before and wasn’t sure quite what to expect. The evening started well with my parking angel providing us with a space right outside the theatre. Nothing worse than driving round looking for parking when you could be in the bar drinking Dalston Cola, a spice and citrus infusion packed with real cola nut – all natural. The theatre has two studios and a fantastic atmosphere. A converted warehouse where plays of social and political relevance can find a home. But not just plays. Each year the Arcola is also home to Grimeborn, a month long festival of opera. So what with the fantastic building, the natural cola and the environmentally friendly toilets, it was a promising start. We queued up, with what I would say was a very mixed audience in terms of age and cultural heritage, to await access to Studio 2. It is a small, cosy and as the evening went on, increasingly warm space. Free seating makes me a bit anxious. Rather like the old days on Ryanair. If you haven’t flown Ryanair for a while they now have allocated seating. But thanks to my parking angel we had arrived in good time to secure good seats. Not very comfortable seats but with a good view of the stage. Stage might be overstating it a bit. There was a raised area with three spindly wooden chairs that gave me concern during the performance as they didn’t look very sturdy but fortunately saw the evening out safely. I would say the play looks at memory, identity and belonging through the eyes of three generations of women. Rosie, played by Jasmine Blackborow, is studying German at University and this has led her to spend a year in Berlin. At the end of this year she has acquired a boyfriend, Sebastain, played by Daniel Donskoy and a feeling that Berlin is calling for her to stay. Berlin had been the home to her half Jewish grandmother Eva before she escaped to England as a girl. Eva, played with great understated humour by Brigit Forsyth, is suffering from the onset of dementia and her memories are fading away. Eva’s daughter Susan, played by Wendy Nottingham, is desperate to capture these memories before it is too late and is a study in anxiety and neurosis. The shadow of the holocaust lies lightly over this play. We are told that Eva’s father, a Jewish doctor, died in a concentration camp and that the early experiences that Eva recounts so calmly have actually left her without the ability to love. In such a small space the explosion of anger and indeed the tussle between Susan and Eva’s second husband Arnold, played by Bernard Lloyd, we’re both a bit of a shock and also for me the only point in the play where I felt it lost a sense of reality. With no interval, (glad I hadn’t ordered interval drinks) we were all heading for the door by about 9.15pm. I had enjoyed the play enormously. Poignant, funny, intense and well worth a trip to Dalston. The play continues at the Arcola until Saturday 27th June. Do catch it if you can. Excellent post! Glad you enjoyed it! Thanks Oliver. I really did enjoy it. Hope the rest of the run goes well.